I love Scripture, those from my own faith and those of other faiths. One of the reasons I love Scripture is because I believe there are an almost infinite number of ways to read, view, and interpret Scripture, so there's always something new to discover and always something personally applicable within them. Or, as the author of this book puts it, "The Bible is bigger than all of us." So it's always fun to get new perspectives on how to read Scripture and see it from a different angle. 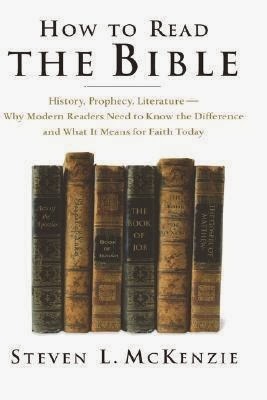 In How to Read the Bible, Steven McKenzie approaches this book of Scripture in a way I'd never considered before: by looking at genre and how we view certain genres differently today than the ancient writers did. McKenzie groups his book into five sections which each explore one genre: history, prophecy, wisdom literature, apocalyptic literature, and epistles. The first section addresses the vast difference in how modern civilization defines "history" and how ancient cultures defined it. For cultures such as ancient Israel, the role of history writing was to explain its present to itself by looking at its past and interpreting its meaning for the contemporary culture, kind of a cause and effect approach that identified what core values and principles were of highest value. One example McKenzie points out is the use of genealogies in the Bible. "In the ancient world...genealogies were a powerful tool for supporting a nation's or people's identity and traditions" and they were, therefore, "not static but were constantly shifting to reflect changes in social relationships." Very different from how we consider history and genealogy today! I'll admit that I struggled with his views on the genre of prophecy, particularly Isaiah. McKenzie states: "Hebrew prophecy was always intimately tied to the prophet's own time and place...The objective of prophecy was the effect change in the religious and social practices of its hearers or readers." So far so good, but he goes on to say, "the genre of Hebrew prophecy in its original setting was unconcerned with the distant future. Therefore, the Hebrew Bible does not contain any prophecy intended as a prediction of Christ." McKenzie views these interpretations as later Christian readings, not necessarily illegitimate, but not initially intended by the original prophets. Contemporary events, he claims, rather than ones in the far distant future are being referenced in all those well-known verses about "a virgin shall conceive," and "a man of sorrows and acquainted with grief." Isaiah has always been one of my favorite books in the Bible because of its beautiful language and its seemingly multi-layered prophecies of Isaiah's time, Christ's time, and the latter days. Having sung Handel's Messiah from a young age, I will never be able to separate Isaiah's prophecies from the interpretation that identifies them with Christ. In the section on wisdom literature, I love that McKenzie points out the diversity, tension and contradiction inherent in the genre. Using the topic of poverty as an example, he pulls out dozens of verses from Proverbs some "that suggest the poor deserve their state" and some that "indicate that the poor are people of honor and integrity and that it is better to be poor than rich". Wisdom literature "is not a set of commands or divinely ordained rules. It is, rather, a collection of the advice gained by ancient Israelites, especially the sages...There was no single 'right' way of looking at things. There was disagreement, because life was and is complex, and circumstances fluctuate. What may be true for one person or a given situation is not necessarily universally so." Apocalyptic literature is a struggle for me, and quite possibly my least favorite portions of scripture, so I appreciated McKenzie's insights here. His reminder that the epistles can only be applied properly "if the historical, cultural, and literary contexts of the letters are taken fully into account" is essential as well. I love critical approaches to Scripture that challenge my current understanding, and make me stretch a little to see them in a new light. Even if I don't whole-heartedly embrace them, I find there is immense value in the exercise. The more I learn, the more I feel my faith is strengthened in all the right and necessary areas, as rather than relying on a single faulty or misguided interpretation, I can better grasp the purpose as a whole and integrate it more fully in my life. I firmly agree with McKenzie here, that "a faith that cannot stand up to challenges or cope with empirical evidence hardly seems worth having."